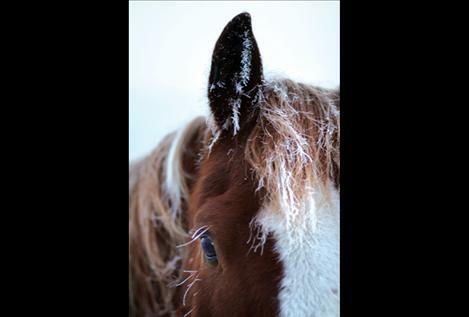 Icicles and frost form on a Round Butte Road horse's face as early morning freezing fog covers the Mission Valley Monday morning. MISSION VALLEY — While the world didn’t end along with the Ancient Mayan calendar, the year 2012 brought with it some interesting weather patterns, to say the least. According to the National Oceaonographic and Atmospheric Association, 2012 was the ninth warmest year on record since 1880, when annual temperatures were first recorded. All 10 of the top 10 warmest years on record fall within the last 15 years. While much of Montana saw rain and 40-degree days leading up to Christmas, many southern states had an unusually white Christmas with several inches of snow. A national drought followed by monsoon-like rain and flooding crippled much of the Midwest’s agriculture and ranching. Arctic sea ice melted to record lows, while 26 tornadoes broke out on Christmas Day, and Hawaii dealt with softball-sized hail. While much of this is bad news, Montana State University Lake County Extension Agent Jack Stivers said mild winters make for happy farmers and ranchers. Western Montana is now more than two months into the 2012-13 winter, and the unseasonably warm weather is having an impact on local farmers and ranchers — a positive impact. Stivers said business costs for ranchers tend to increase significantly during the winter months and drastically once the weather gets below zero. Everything from hydraulic hoses on heavy equipment to diesel engines tends to work better in mild weather. In extremely cold weather, animals require more feed to compensate for the extreme cold and their water sources often freeze, creating more work for animal and rancher alike. “There’s a lot of good things behind a mild winter,” Stivers said. Irrigator Dan Salomon said the winter isn’t over yet, so it’s still a bit too early to tell if the mild weather is a good thing. Even so, “It’s easier to feed and get around when (the temperature) is low in the teens and 20s rather than when it’s below zero,” Salomon said. Ronan rancher Lonnie Metzger said mild winters save him a good deal of money as his cattle and horses require less feed. Metzger regimented his grass fields toward the end of fall, allowing him a surplus for the winter months. Had the temperature dropped significantly and frozen the grass, Metzger would have had to begin hay-feeding his stock much earlier. As it is, he says he’s only got a small portion of his horses on hay, and only started feeding them hay in January. Stivers said the mild weather could translate into a larger insect population, come spring. “Mild winters are really a blessing, in a way, but hard winters help with reducing the insect population,” Stivers said. Trees in the area are also vulnerable to “sun scalding.” Stivers said this happens when the cells on the side of a tree thaw during warmer days and freeze during cold nights. This kills the cells and results in a blotchy color around the tree trunk. Stivers said he sees sun scalding every year regardless of temperature. In addition, a lack of moisture in the Mission Mountains could translate to less irrigation water in the coming growing season, but Stivers said, “The snow we have on the ground now looks promising,” and he isn’t the least bit concerned.